Last week I spent five days in the driver’s seat, crossing the country from east to west, mostly on Interstate 80. I’ve made the trip before, though never on this route. In particular, the 900-mile stretch from Lincoln, Nebraska, across the southern tier of Wyoming, and down to Salt Lake City was new to me. Driving is a task that engages only a part of one’s neural network, so the rest of the mind is free to wander. On this occasion my thoughts took a political turn. After all, I was boring through the bright red heart of America. Especially in Wyoming. The other singular distinction of Wyoming is that it has the smallest population of all the states, estimated at 579,000. The entire state has fewer people than many U.S. cities, including Albuquerque, Milwaukee, and Baltimore. The population density is a little under six people per square mile. I looked up these numbers while staying the night in Laramie, the state’s college town, and I was mulling them over as I continued west the next morning, climbing through miles of rolling grassland and sagebrush with scarcely any sign of human habitation. A mischievous thought came upon me. What would it take to flip Wyoming? If we could somehow induce 125,000 liberal voters to take up legal residence here, the state would change sides. We’d have two more Democrats in the Senate, and one more in the House. Berkeley, California, my destination on this road trip, has a population of about 120,000. Maybe we could persuade everyone in Berkeley to give up Chez Panisse and Moe’s Books, and build a new People’s Republic somewhere on Wyoming’s Medicine Bow River. Rather than trying to flip Wyoming, maybe one should try to fix it. Why is it the least populated state, and the most Republican? Why is so much of the landscape vacant? Why aren’t entrepreneurs with dreams of cryptocurrency fortunes flocking to Cheyenne or Casper with their plans for startup companies? 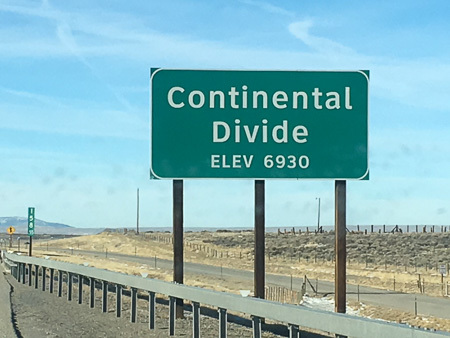 The experience of driving through the state on I-80 suggests some answers to these questions. I found myself wondering how even the existing population of a few hundred thousand manages to sustain itself. Wikipedia says there’s some agriculture in the state (beef, hay, sugar beets), but I saw little evidence of it. There’s tourism, but that’s mostly in the northwest corner, focused on Yellowstone and Grand Teton national parks and the cowboy-chic enclave of Jackson Hole. The only conspicuous economic activity along the I-80 corridor is connected with the mining and energy industries. My very first experience of Wyoming was olfactory: Coming downhill from Pine Bluffs, Nebraska, I caught of whiff of the Frontier oil refinery in Cheyenne; as I got closer to town, I watched the sun set behind a low-hanging purple haze that might also be refinery-related. The next day, halfway across the state, the Sinclair refinery announced itself in a similar way. Still farther west, coal takes over where oil leaves off. 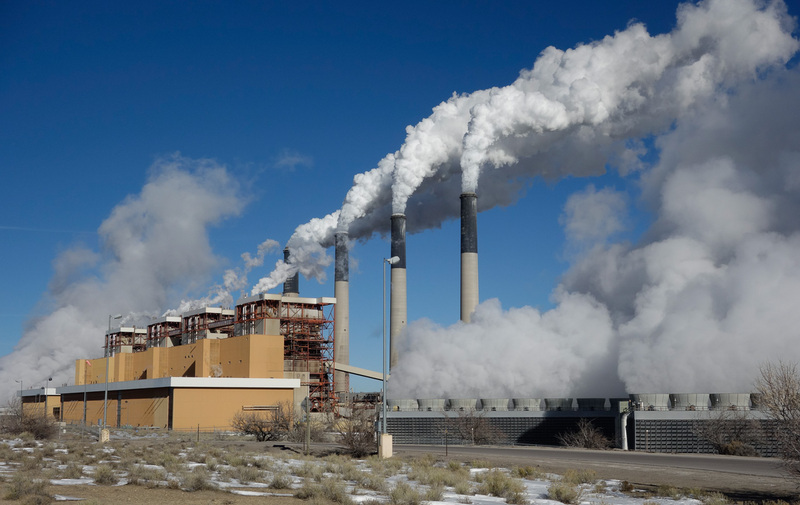 The Jim Bridger power plant, whose stacks and cooling-tower plumes are visible from the highway, burns locally mined coal and exports the electricity. As the author of a book celebrating industrial artifacts, I’m hardly the one to gripe about the presence of such infrastructure. On the other hand, oil and coal are not much of a foundation for a modern economy. Even with all the wells, the pipelines, the refineries, the mines, and the power plants, Wyoming employment in the “extractive” sector is only about 24,000 (or 7 percent of the state’s workforce), down sharply from a peak of 39,000 in 2008. If this is the industry that will build the state’s future, then the future looks bleak. Economists going all the way back to Adam Smith have puzzled over the question: Why do some places prosper while others languish? Why, for example, are Denver and Boulder so much livelier than Cheyenne and Laramie? The Colorado cities and the Wyoming ones are only about 100 miles apart, and they share similar histories and physical environments. But Denver is booming, with a diverse and growing economy and a population approaching 700,000—greater than the entire state of Wyoming. Cheyenne remains a tenth the size of Denver, and in Cheyenne you don’t have to fight off hordes of hipsters to book a table for dinner. What makes the difference? I suspect the answer lies in a Yogi Berra phenomenon. Everybody wants to go to Denver because everyone is there already. Nobody wants to be in Cheyenne because it’s so lonely. If this guess is correct, maybe we’d be doing Wyoming a favor by bringing in that invasion of 125,000 sandal-and-hoodie–clad bicoastals. One more Wyoming story. At the midpoint of my journey across the state, near milepost 205 on I-80, I passed the sign shown at left. 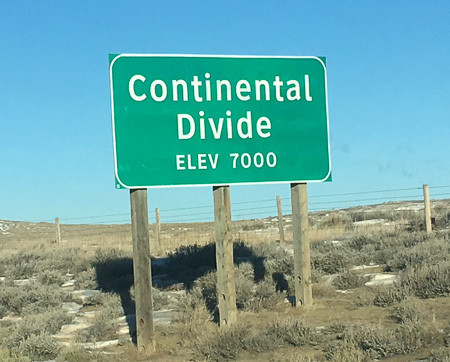 I am an aficionado of continental divide crossings, and so I took particular note. Then, 50 miles farther along, I passed another sign, shown at right. On seeing this second crossing, I put myself on high alert for a third such sign. This is a matter of simple topology, or so I thought. 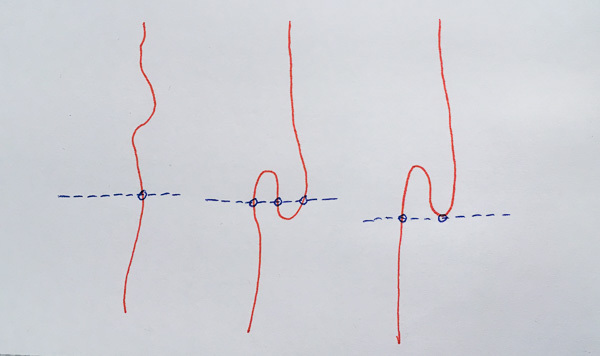 If a line—perhaps a very wiggly one—divides an area into two regions, then if you start in one region and end up in the other, you must have crossed the line an odd number of times. Shown below are some possible configurations. In each case the red line is the path of the continental divide, and the dashed blue line is the road’s trajectory across it. At far left the situation is simple: The road intersects the divide in a single point. The middle diagram shows three crossings; it’s easy to see how further elaboration of the meandering path could yield five or seven or any odd number of crossings. An arrangement that might seem to generate just two crossings is show at right. One of the “crossings” is not a crossing at all but a point of tangency. Depending on your taste in such matters, the tangent intersection could be counted as crossing the divide twice or not at all; in either case, the total number of crossings remains odd. In the remainder of my trip I never saw a sign marking a third crossing of the divide. The explanation has nothing to do with points of tangency. I should have known that, because I’ve actually written about this peculiarity of Wyoming topography before. Can you guess what’s happening? Wikipedia tells all. This entry was posted in mathematics, modern life, social science, technology. Enjoyed your post about Wyoming. Despite its lack of diversity and civilization it is a geological wonderland to me. I spend as much time there as I am able. Almost all of the people I’ve met there are friendly and welcoming, but I believe that describes just about anywhere in the world I’ve visited. I had to smile at your tongue-in-cheek political proposal. I typically avoid discussions of politics and religion, but I would simply say that any kind of polarization gives me pause. I not sure that “how do we flip them?” is the right question. The question I ask myself is “how can an election disenfranchise so many voters across the nation both before and after the fact?” I am a proponent of the long view. I bend, but do not break. I hope everyone learns to bend more and break less. Things change and soon they change again, etc., etc. I enjoy your posts.